Strathcarron Hospice is preparing for a fabulous birthday party ... and the whole community is invited. 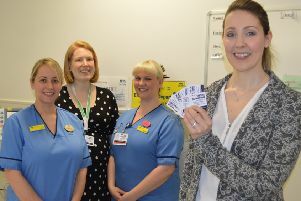 As staff and patients prepare to celebrate the Denny facilities 38th birthday, it is asking people to mark the occasion by hosting a coffee morning or afternoon tea at home or in their workplace and raise vital funds for the hospice. Friday, May 3 is the day for Big Birthday Teas to take place across the district. This week, Strathcarron held an afternoon tea for patients, staff and visitors to launch its latest fundraising campaign. There was tea and lots of cakes on offer, including a bespoke birthday cake and cupcake bouquet provided by Karen’s House of Cakes from Crieff. The campaign is being supported by Solicitors for Older People Scotland. Marion Blaney, Strathcarron Hospice community campaign coordinator, said: “The campaign invites everyone to get involved by simply hosting a coffee morning, bake sale or afternoon tea at home, work or in the community on May 3. “Central FM will be making some surprise visits to those signed up to take part so there’s even a chance to be live on air with the team! And if May 3 doesn’t suit, don’t worry because you can host your event on any day throughout April and May to help raise funds for all the work carried out at Strathcarron. The hospice currently needs £12,900 every day to continue to operate, providing care for in patients, out patients and in the community. A donation of £24 would provide one hour of nursing care. The idea of a hospice and its planning started back in 1975 when Dr Harold Lyon met with a few friends to consider whether their vision of a hospice was achievable. Following years of planning and fundraising, as well as locating suitable premises, it was finally ready to open its doors to the first patients on April 21, 1981. Today it cares for 1200 people every year at a cost of over £6 million. To sign up to host a Big Birthday Tea, visit https://www.strathcarronhospice.net/big-birthday-tea-19 or call 01324 826222.